WEST LAFAYETTE, Ind. -– The 22nd-ranked Purdue women’s swimming and diving team broke two records while recording 12 scoring places Friday evening to round out day three of the Big Ten Championships inside the Boilermaker Aquatic Center in West Lafayette, Indiana. Seraphina Van broke Purdue's freshman record in the 100 butterfly Friday evening at the Big Ten Championships. Junior Ariel Martin earned her third runner-up finish and broke her seventh record of the championships when she finished the 200-yard freestyle in 1 minute, 45.55 seconds. The Jeffersonville, Ind., native lowered her previous program record of 1:46.15 she set while leading off the second-place 800 freestyle relay Wednesday night. Martin also finished second in the 50 freestyle Thursday evening with a new program record of 22.50. 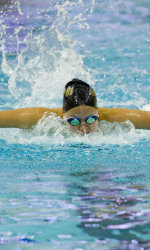 Seraphina Van took down the oldest freshman record on Purdue’s books when she won the 100 butterfly ‘C’ final in 55.05. The time betters Erika Whyte’s record of 55.86 that had stood since 1996 and moves Van to third on Purdue’s all-time performance list in the event. Van now holds two freshman records after earning the 200 breaststroke mark at the Purdue Invitational on Nov. 22. Junior Allie Smith finished fourth in the 100 backstroke with her time of 53.66. The Green Bay, Wis., native finished the race just four-hundredths of a second away from the school record of 53.62 she set during Friday’s preliminary session. Classmate Katie Beck improved her NCAA provisional-qualifying time in the event and finished 14th by touching the wall in 55.30. Sophomore Lauren Roth improved her standing in second on Purdue’s all-time performance list and moved up the list of NCAA provisional qualifiers in the 200 freestyle. Roth, who briefly held Purdue’s 500 freestyle record during Thursday’s preliminary session and sits second on that event’s all-time performance list, finished fifth in the 200 freestyle with her time of 1:46.88. Fellow sophomore Jessica Davis added fourth-place points to the team total and improved her standing in second on Purdue’s all-time performance list in the 100 breaststroke. The Tempe, Ariz., native moved up on the list of NCAA provisional qualifiers with a season-best time of 1:00.91. Junior Lisa Butler improved her standing in fourth on Purdue’s all-time performance list in the 200 freestyle while winning the ‘B’ final. The Holland, Mich., native outraced the field to the wall in 1:47.65 to improve her standing on the NCAA provisional qualifiers list and better her preliminary time of 1:47.85. The Boilermakers grabbed three scoring positions in the 3-meter diving competition. Junior Erin Mertz led the group by finishing fifth with her season-best score of 349.70 that improves her standing in sixth on the program’s all-time performance list in the event. Sophomore Casey Matthews took seventh after scoring 317.20 in the final, and junior Kara Cook scored in 14th with 280.15. Purdue’s 400 medley relay began the session by finishing fifth and just missing a school record. Smith, Davis, Beck and Leah Henninger combined to complete the race in 3:40.51, bettering the NCAA provisional-qualifying standard and missing the school record by 22-hundredths of a second. Sophomore Kristen Gilson scored in 14th place in the 400 IM with her season-best time of 4:20.17. Freshman Emily McIlrath also earned a 14th-place finish as she completed the 100 breaststroke in 1:02.94 after posting a new Purdue freshman-record time of 1:02.62 in Friday’s preliminary session. Sophomore Christina Jacobs finished 20th in the event with her time of 1:03.47. Senior Christine Inman, who before the session was recognized as Purdue’s sportsmanship honoree, earned a 20th-place finish in the 100 butterfly when she touched the wall in a season-best time of 55.59. Junior Mary-Margaret Lopez finished 24th in the event with her 57.70 clocking. Henninger touched the wall in 1:50.29 to finish 24th in the 200 freestyle. Purdue has broken 13 program records and three freshman records during the first four sessions of the Big Ten Championships. The team also has recorded 69 season-best marks during the conference championship meet. With seven events remaining on the final day, Purdue is in third place with 318 points. Defending champion Indiana leads the team race with 451, and Minnesota sits second with 418.5. Behind the Boilermakers, Michigan’s 314.5 points and Ohio State’s 283.5 total round out the top five. Action concludes Saturday with a preliminary session set for 11 a.m. ET to be followed by finals at 6:30 p.m. A complete schedule of events, as well as live results and live video from the championships, can be found at purduesports.com.